I'm here in Seattle at Jaguar's F-Type launch event, and just heard lead designer Wayne Burgess talk about the design of the car. He mentioned three design easter eggs I thought you might like to know as soon as possible. Because, you know, why should you have to wait? The first we've discussed before, but it's cool enough that it's worth repeating, and I think I have at least a little something to expand on. 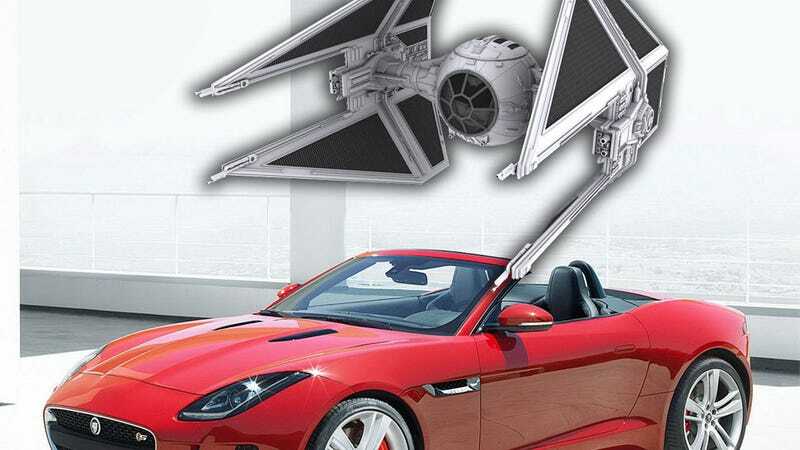 It's that the design of the headlights was based on the look of a TIE Fighter from Star Wars. That's right, Sienar Fleet Systems' venerable Twin Ion Engine fighter, the backbone of the Empire's fighting force. In looking at the lights, I think it's actually based on the slightly later TIE Interceptor, what with those angled side solar/radiator panels and all. The lights were also a loose interpretation of the E-Type's lights which, and I never knew this, are referred to as "fingernail" lights. If you look at them, they do sort of look like a nice lady's fingernail. Twosly, there's the orange-coppery accent color found in the F-Type's cockpit and on certain exciting controls. Originally, the designers were trying anodized reds and other colors, but weren't satisfied. Wayne Burgess happened at one point to scratch his chin, when a collegue saw his watch, which sported a striking metallic orange bezel. She took the watch from him and used it to duplicate the color and finish which then became the bronze accent color used in the car. This story may not be entirely true, as I've heard a rumor he was actually picking his nose, not scratching his chin. We may never know. And finally, there's two little bits about the exhaust pipes. The pair of center-exiting exhausts on the V6 model is meant to hearken back to the old E-type. These pipes are sculpted out of a solid aluminum block, and that method of manufacture is actually from the company that makes the exhaust for Moto Guzzi motorcycles. The company that perfected the process was found by a Jaguar designer on a vacation to Italy, and a sample was brought back, with much drama, in a fancy leather briefcase. The V8's four exhausts are perforated with holes to get the exhaust note sounding just right. The engineers came up with the method, which was only needed on the inner set of pipes, but the designers liked the look of it so much they had the perforations used on all four pipes. The reason they liked them? Because they reminded them of jet afterburners. So there you go. Now when you go out and buy a couple of these later today, you'll have some fun stuff to point to as you take them out to try and get laid or whatever. More F-Type coverage to come!